Corrosive storage buildings offer a safe, secure and protected storage environment for corrosives and other hazardous materials. Two classes of chemicals that pose the greatest risk to human and environmental health are classified as corrosive substances, including acids and bases, and flammable and combustible chemicals. In this article US Chemical Storage illustrates corrosive chemical types, as well as the hazards associated with storing and handling corrosive chemicals. Improper storage of corrosive chemicals can impact worker safety and damage costly investments. Corrosive chemicals have the potential to damage other chemicals and surfaces that it comes in contact with. Corrosive storage buildings are designed to minimize damage from chemical spills and segregate incompatible chemical classes. Material Safety Data Sheets (MSDS) fore each type of chemical, should be on-hand and reviewed prior to handling or storing corrosive materials. Eye protection and skin protection should be addressed before handling or storing corrosive chemicals. Proper protection methods should be used at all times. Do not store corrosive chemicals above eye level. Segregate acids and bases in corrosive storage buildings. Use fume hoods if there is a possibility that laboratory operations generate dust, fumes or chemical particles. Store corrosive chemicals away from oxidizers, water, and heat sources. Containers must be completely sealed. When storing or handling corrosive gases, ensure gas cylinder regulators and valves are completely closed when the cylinder is not in use. Store incompatible materials in separate chemical storage rooms. Anticipate emergency situations by having proper handling equipment present. Organize storage on racks and/or shelving systems to ensure chemicals are safe to handle. Label chemical containers that are stored inside your corrosive storage building. Label the outside of corrosive storage buildings to illustrate storage atmospheres. Contact your local Department of Environmental Health and Safety for more information on storing corrosive chemicals and proper disposal methods for each chemical. 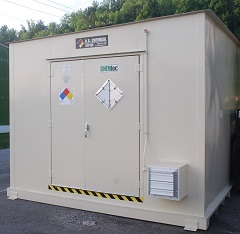 Corrosive storage buildings by US Chemical Storage offer safe storage atmospheres for storing corrosive chemicals and other hazardous materials. Fire-rated and non-fire rated chemical storage solutions are available to meet all of your chemical storage needs. Meets EPA, OSHA, NFPA, IBC, IFC regulations and FM or Warnock Hersey approvals. Learn more at US Chemical Storage to find out how to compliantly store your corrosives and other hazardous materials including flammables and combustibles.